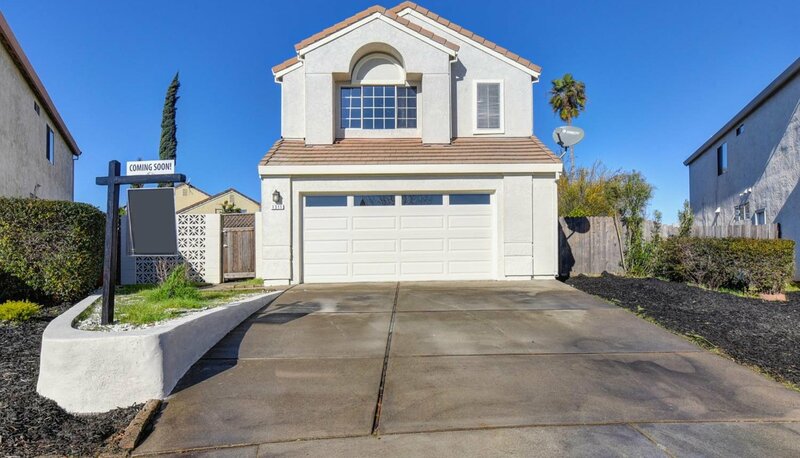 This completely renovated Roseville home has 3 bedrooms, 3 full bathrooms, a 2-car garage, and a large private backyard with plenty of space perfect for entertaining and enjoying the built-in pool. The upstairs bedrooms each have their own full bathroom and their own walk-in closets. The downstairs bedroom could also be used as a den or office. The renovated kitchen includes a beautiful new quartz countertop, stainless steel LG stove with 5-burner range, LG dishwasher, new stainless steel sink, and tile flooring. All of the bathrooms have new quartz that matches the kitchen as well as brand new fixtures. The flooring is German laminate in the family room and bedrooms, tile in the kitchen and dining rooms, and carpet on the stairs and hallway. The home also has a new furnace, new garage door with new opener, new water heater, and new LED can lighting throughout. The cathedral ceiling and large windows keep this home full of light! Use this link https://shar.es/amHGHv for a 3D Tour. Listing courtesy of Realty One Group Complete. Selling Office: Coldwell Banker Residential Brokerage.